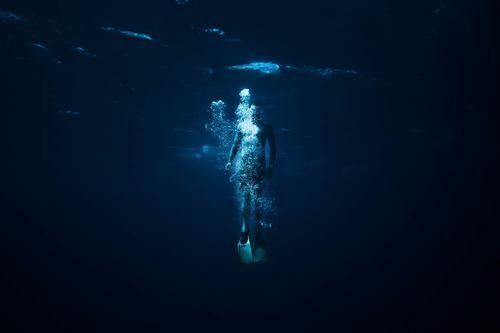 The mammalian diving response, or "dive reflex," is the way our body automatically prioritizes blood delivery to the brain and heart when we hold our breath underwater. When your head is underwater, you are using up the oxygen in your blood and not replacing it by breathing, a condition known as hypoxia. The brain and the heart are exceptionally sensitive to hypoxia, whereas other parts of our body, such as our arms and our legs, can tolerate hypoxia much more easily. Immersing your face in cold water triggers the trigeminal nerve (also called the fifth cranial nerve) in your face and sends signals to the brain. The brain then activates the vagus nerve (or 10th cranial nerve), which is part of the autonomic nervous system. The autonomic nervous system helps control things such as our heart rate and breathing without us having to think about it. The vagus nerve slows down the rate at which our heart beats; when it beats more slowly, it doesn't need as much oxygen to function. Simply being immersed in water creates a hydrostatic pressure effect on the body that essentially squeezes some of the blood from our extremities back toward our heart. The vagus nerve also causes certain blood vessels to constrict (called vasoconstriction), subsequently pushing even more blood from our extremities back toward our heart and brain. Immersion of your face in cold water or breath holding can cause these effects, but they are much more pronounced if you hold your breath while also immersing your face in cold water. Interestingly, there is also a response by our spleen to breath holding underwater. Red blood cells carry oxygen in our blood to our tissues. Extra red blood cells are stored in the spleen and can be added into the blood circulation during times of stress — such as hypoxia, bleeding and strenuous exercise — by the action of splenic contracture. Extra red blood cells allow more oxygen to be carried to where we need it. Some populations of indigenous breath-hold divers, such as the Bajau of Southeast Asia, have developed larger spleens and thus a larger reservoir of red blood cells and better tolerance to hypoxia. Conversely, we don't see this effect in people who have had their spleen removed. All diving mammals experience these dive reflexes, although in humans it is less intense than in diving animals. Elephant seals, for example, can dive to more than 5,000 feet holding their breath and during migration can spend more than 80 percent of the time underwater. Researchers tracked an elephant seal that breath held to more than 4,000 feet for two hours. Whether you fall into the water by accident or you are holding your breath for competition, your brain and heart need oxygen. While we may not be as adept as the elephant seals, you can see how the dive reflex helps to ensure our brain and heart get the oxygen they need when we hold our breath underwater.